A warm combo of veggies make for a great side dish. To remove eggplant's bitter flavor, sprinkle slices with salt and let sit for 30 minutes before cooking. 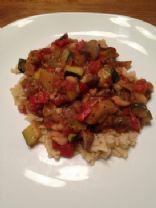 This is an adaptation of Susan Voisins' recipe at Fat Free Vegan. It is so creamy and tasty you would never pick it for Vegan.